Author bio: Troy Camplin, earned a Ph.D. in the Humanities from University of Texas at Dallas, a M.A. in English from the University of Southern Mississippi, and a B.A. in recombinant gene technology from Western Kentucky University. He lives in Richardson, Texas. Description: What happens when a brilliant man’s love goes unrequited? This novella by Troy Camplin explores such a theme. 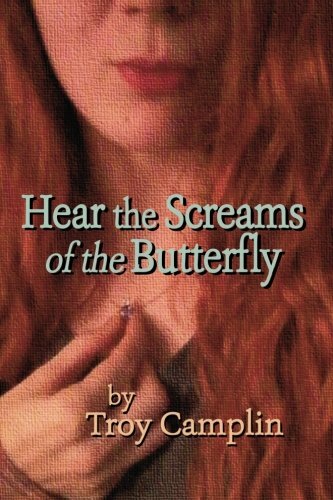 Hear the Screams of the Butterfly is modeled after Wilhelm Wolfgang von Goethe’s The Sorrows of Young Werther, considered the first masterpiece of Romantic literature. This tale is told from the point-of-view of a man who has lost his dearest possession, his mind. Camplin explores the themes of revelation of truth, living authentically, and questioning the validity of imposed authority. While Patric is hospitalized, his closest friend encourages him to write his story to release the troubles he faces. The reader catches glimpses of a man on edge who sincerely tries to keep his life in order but finds everyday reality too taxing and demanding. Troy Camplin reminds us why we live, how our lives can turn from us any moment, and why we should soak up our living desires at each turn. There are existential questions posed here, and you won’t find easy answers. Existentialism itself is put on the rocks. There are hints of a libertarian’s contempt for a social order that places demands on its constituents without granting the means to satisfy them. Existentialism only asks one thing: to live passionately and authentically. As we read this novella we are left with the impression Camplin has done just that.